The photo doesn’t do justice to the fascinating iridescent blue color of these butterflies. Nor does it do justice to how that color is produced. The butterfly is actually not blue. This entry was posted on 03/18/2016 at 20:19 and is filed under Photos. You can follow any responses to this entry through the RSS 2.0 feed. You can leave a response, or trackback from your own site. Nice photo! 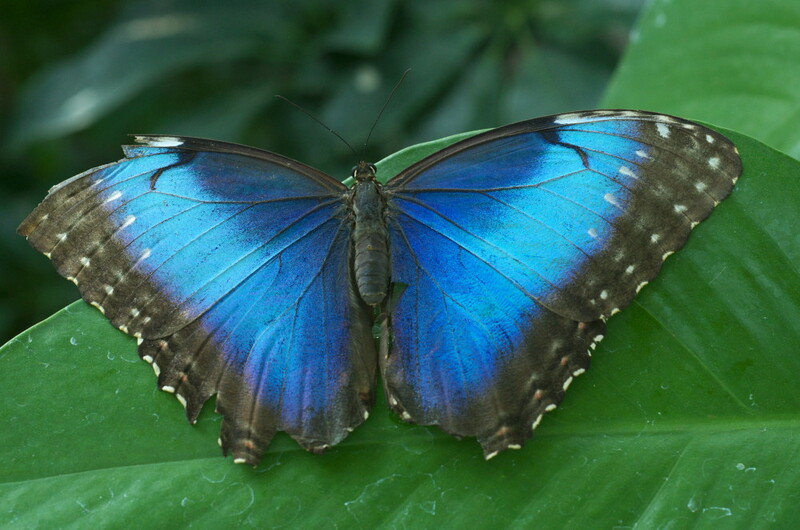 I got to see these when I visited Costa Rica, and they were such a delight to see fluttering about. Thanks. They never seem to stop moving. These were in a butterfly house here. He might have been a zombie? Good thing you got out of there! It is pretty cool. Wikipedia has a deeper explanation of how it’s done, just a bit over my head however. Thanks for the link to how the butterflies are pigmented – this is something new I learn today. Stunning photo! Thanks – they are a stunning butterfly. Nice photo. Looks like something has been nibbling around on him. Thanks. Yes, it’s pretty common to see ragged edges on the wings. I don’t know whether that’s normal wear and tear or as you suggest a little bit of nibbling going on.